The four seasons, summer, autumn, winter…. then spring. Although we are unable to celebrate the arrival of spring here in Singapore, but all thanks to Brotzeit German Bier Bar & Restaurant, we are able to commemorate one of the oldest traditions of Germany – Maifest, the celebration of spring. Come May, Brotzeit will be bringing you this joyful spirit of Maifest from 10 to 13 May 2012. And to go along with this authentic Bavarian feast, German folk band, Swiss Alpine Lions will also be performing exclusively at the VivoCity outlet for three consecutive nights – Friday to Sunday. And HFB was honoured to have an early celebration along with a few friends when he was invited to sample the Brotzeit Maifest Platter. 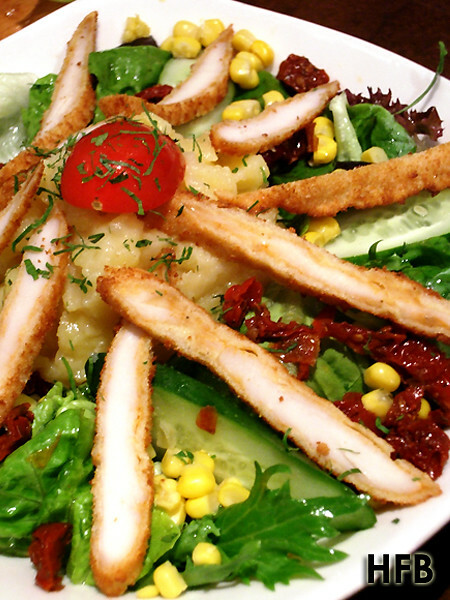 Dinner commenced with the Crispy Chicken Salad that consisted of mixed salad with chicken fillet and potato salad, tossed with house dressing. HFB definitely enjoyed the potato salad that was balanced in flavours, but was a little disappointed with the chicken fillet that he felt was a little too thin and a tad dry considering that was the star ingredient of the dish. 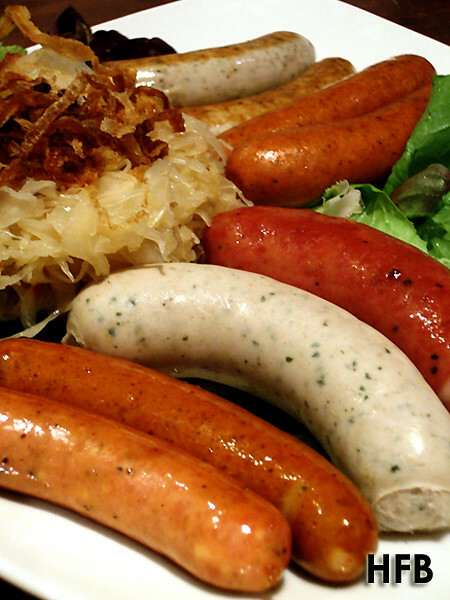 However, there was nothing a Sausage Platter couldn’t make up for – a mix selection of five types of sausages that came with Fries and Sauerkraut (which arrived with a nice touch of fried onions at the top), it was definitely a dish that that would satisfied anyone and everyone. For those who loved a little tingling aftertaste, the Spicy Chicken Sausages were sure to gratify your taste buds. And for those who loved cheese oozing out with every bite of the sausages would sure be pleased with the Pork Cheese Sausages. While HFB did find the Garlic Pork Sausage modestly salty, the flavourful smoky exterior of the sausage more than made up for it. In contrast, the Nurnberger Sausages made without the smoking process and simply grilled was definitely milder in terms of taste and flavour. However one of the highlights for HFB that evening was the amazing Weisswurst, a combination of veal and pork sausage specifically produced from Brotzeit’s own secret recipe which was really robust in flavours and truly tender to the bite! Nevertheless, the focal attraction that evening was definitely the Brotzeit Maifest Platter, priced at $118 featuring Brotzeit’s (yes, more) sausages, Pork Knuckle, Pork Belly and Roast Chicken to share (we had 6 people that day but we couldn’t even stomach everything!!!). 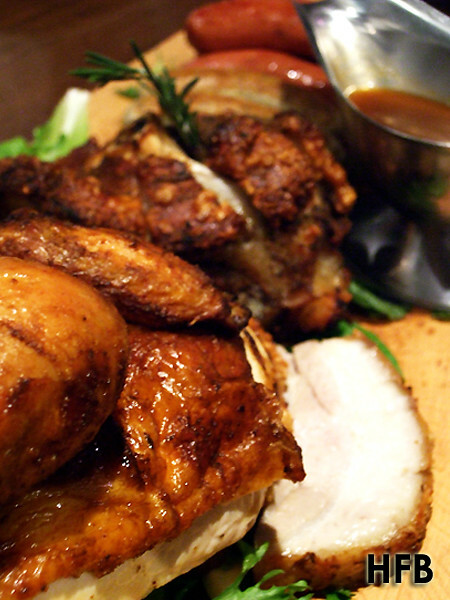 What more could HFB comment about the Pork Knuckle apart from AWESOME! He had the serving closest to the bone and boy was the meat really flavourful and the crackling of the skin, simply divine! He had tried a few pork knuckles in his lifetime and that definitely ranked way up the chart. While HFB had a concern with the crackling (or a lack thereof) of the pork belly, HFB was pleased at how nicely marbled the meat was – let’s just say he had a few more pieces than he should – it was that enjoyable! And although the last hurdle HFB had to tackle was the Roast Chicken, he would be more than glad to go through it again. Marinated for hours and really couldn’t be roasted any better, the chicken came really succulent and nicely seasoned; it was a pity he couldn’t stomach a lot more. 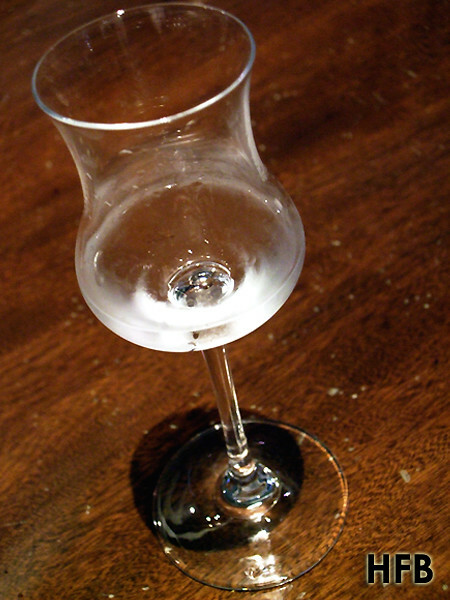 Sensing that our tummies were really bloated, our hosts suggested ordering Schnapps, a type of European fruit brandy, which supposedly aid in digestion. A quick shot of it brought me back to my clubbing days; it was really intense! But sure enough, we were ready for our dessert. 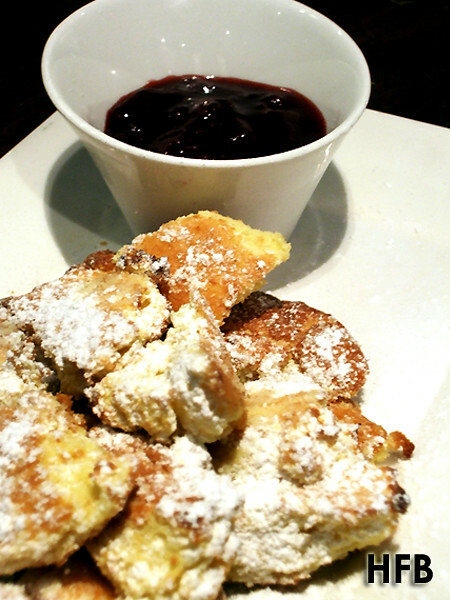 The Emperor’s Cake, or basically shredded pancakes with rum and raisins served with plum (or was it raspberry?) sauce was really enjoyable. Despite our protest of having more food being served, the desserts were snapped up in no time. It was really comforting having a warm dessert accompanied with a nice thick fruity sauce served in front of you. This had HFB endorsement! To celebrate this festival of spring, Brotzeit has graciously sponsored a Maifest Platter each to THREE (3) lucky winners!!! All you have to do is answer the following question and send it to marketing@brotzeit.co with your Name, NRIC, and Contact Number. Closing date for this contest is 2359 hrs, 3 May 2012 (Thu). Q: How much is the price of the Brotzeit Maifest Platter? • This voucher is only valid from 10 to 13 May 2012 at Brotzeit German Bier Bar & Restaurant from the date of issue above and is non-transferable; non-refundable and not exchangeable for cash. • Reservations are recommended. Please state use of voucher when making reservations. • This voucher is not valid unless it is duly stamped and signed by authorized personnel. 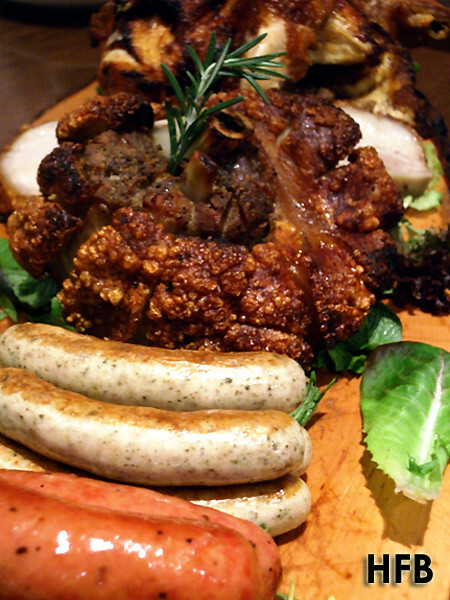 • Voucher may be redeemed for Brotzeit’s Maifest Platter only, excluding beverages of any kind. • Please note that only original certificates will be accepted and kindly present this voucher when you dine at the restaurant. Disclaimer: No ratings would be given, as this is an invited media tasting. HFB would also like to take this opportunity to thank Brotzeit and Jia Wei and Zijing for their hospitality. The Sausage Platter looks good and colourful too!